The full Carcassonne Experience! The Base game, 4 expansions, and much more in one box! 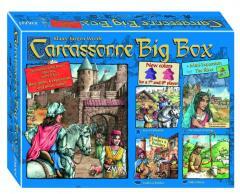 Whether you’re a huge Carcassonne fan or experiencing this award-winning game for the first time, the Carcassonne Big Box has something for everyone. The expansions included in the box change the game in new and exciting ways and can be used in any combination, guaranteeing a new experience every time you play. In addition to the base game, you will find the following expansions: Inn & Cathedrals, Traders & Builders, The River, Hills & Sheep, and The Wheel of Fortune! Inside you will also find two brand new colors of followers, allowing you to play Carcassonne with 7 or 8 players for the first time.